Melcher Media Inc, 9781595910745, 176pp. According to Sam and Andrew Wyly, it's simple: Texas got it right The Lone Star State's long tradition of walking the path less traveled has made it a constantly renewing hotbed of invention and entrepreneurial can-do. From the birthplace of Whole Foods, Southwest Airlines, and Green Mountain Energy has come the innovation that has quadrupled America's natural gas and oil reserves in the past ten years, creating good jobs across the country and abroad. The most military-friendly state in the union is now leading the country in its use of high-tech windmills and is making it more likely that we ll soon bring an end to wars over Arab and Persian oil. 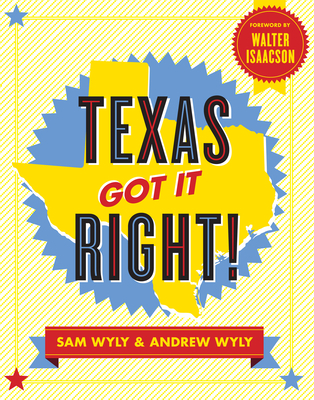 The Wylys new full-color, fully illustrated book of true boasts, Texas Got It Right , argues that the state's success stories can inspire the rest of the country. This astute and provocative look at Texan policies, history, and culture is packed with ideas begging to be exported to the other, less fortunate 49 states. Sam Wyly Sam Wyly was raised in small-town Louisiana. In 1957, he got his MBA from the University of Michigan and began his career as a salesman for IBM and then a manager for Honeywell. Six years later, at the age of 28, Wyly was out on his own, creating his first company, University Computing, which married computer technology services to telephone technology to serve first local businesses and then multinational companies in the United States and Europe. This became the first of six enterprises that Wyly grew to over $1 billion valuations. Over the next fifty years, Wyly became one of America's top multiple entrepreneurs, building companies in industries ranging from oil and gold mining to arts and crafts, from software to budget steakhouses and clean electricity. Wyly is a philanthropist, an avid reader, and a family man. He resides in Dallas and in Aspen with his wife, Cheryl, and has six children, twelve grandchildren, and two great-grandchildren. Wyly's memoir, 1,000 Dollars & an Idea: Entrepreneur to Billionaire, was published in 2008, and his illustrated business biography, Beyond Tallulah by Dennis Hamilton, came out in 2011. Andrew Wyly Andrew Wyly is an entrepreneur, investor, and film producer. Born and raised in Los Angeles, California, with some schooling in Switzerland, he has been a Texan by choice since 2004. After earning a bachelor's degree in history from Denison University, Andrew worked as a sales agent for Green Mountain Energy and managed a portfolio for a hedge fund. He has continued his interest in political economics through participation with several think tanks. In 2007, he created the Andrew Wyly Film Company. Blood Shot, his first feature film, was completed last year. Walter Isaacson Walter Isaacson, the CEO of the Aspen Institute, has been chairman of CNN and the managing editor of Time magazine. He is the author of Steve Jobs; Einstein: His Life and Universe; Benjamin Franklin: An American Life and Kissinger: A Biography. He lives in Washington, D.C.